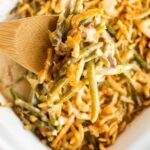 Slow Cooker Fresh Green Bean Casserole uses premium frozen green beans and a homemade sauce for a healthier and even more delicious holiday side dish! I must share with you that my absolute favorite holiday of all is Thanksgiving. I guess that’s fitting for a food blogger since Thanksgiving tends to revolve around all the food! This year I’m going to be cooking a 22 pound turkey since we always have everyone at our house for the holiday. And I’m pretty excited that I already purchased our bird this year since last year we were scrambling to find a one big enough to feed everyone (plus, leftovers!! Mandatory!). But that big old turkey is going to be taking up all that precious oven space. I am actually lucky enough to have a bottom drawer oven as well but that is going to be filled with all of our yummy rolls baking away. So, what in the world to do about all the necessary sides? Well, every year I get all my slow cookers going and this year will be no exception. But there will be one difference! 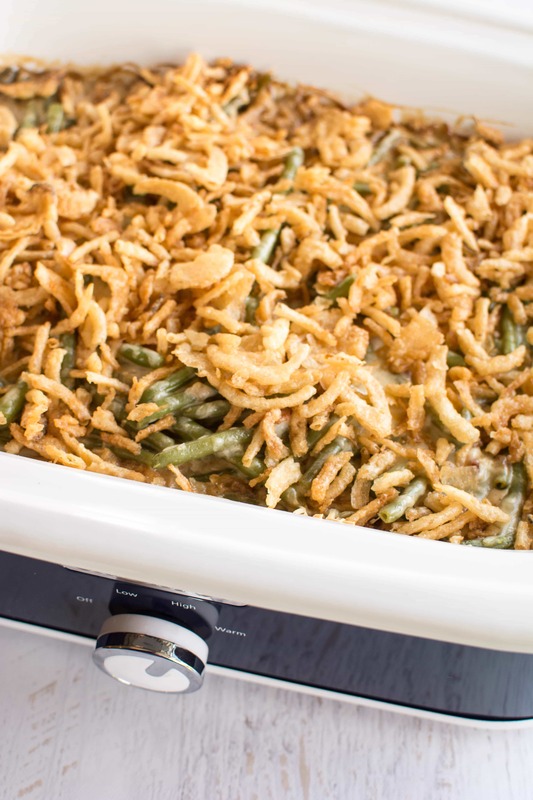 I just went and bought myself a casserole slow cooker and did a test run with this amazing from scratch Slow Cooker Fresh Green Bean Casserole! For this version of a green bean casserole you will start out with browning up some delicious thick cut bacon! In that you will saute up some shallot and garlic until crispy and then using a little flour and broth you will make a nice little sauce. But this is a holiday after all so let’s just add a nice cup of heavy cream as well! Add it over some premium frozen thin cut green beans and top it all off with some fresh shredded Parmesan cheese. Amazing!! The best part? This cooks PERFECTLY in the casserole slow cooker! Woohooo! We took down the entire test pan of this and vowed to make a double batch on Thanksgiving day. Okay fine, I get it. 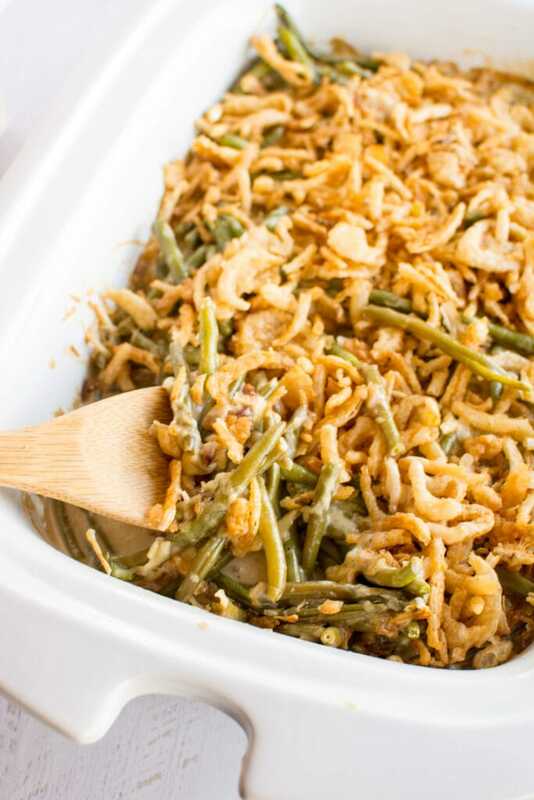 No green bean casserole is complete without crispy onions. Go ahead and toss those on top for the last 15-30 minutes and you have a perfect finish. Leave the crock on warm until you are ready to eat and it will keep perfectly. Here’s a link to the slow cooker I used on Amazon. You can usually find them at Target and Wal-Mart too! I was super pleased with how well this slow cooker “baked” my casserole. Everything cooked evenly and the cheese melted perfectly over the top. 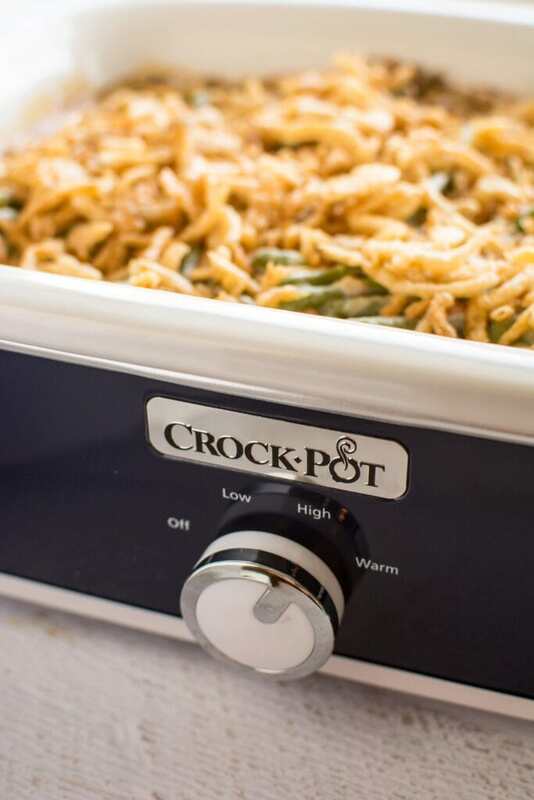 I use this slow cooker for so many things so make sure to check out this post for more ideas! 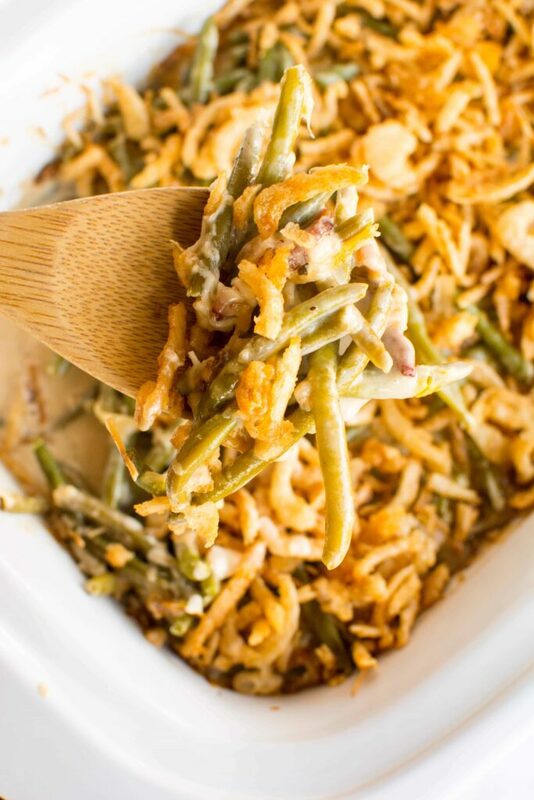 Slow Cooker Green Bean Casserole uses premium frozen green beans and a homemade sauce for a healthier and even more delicious holiday side dish! 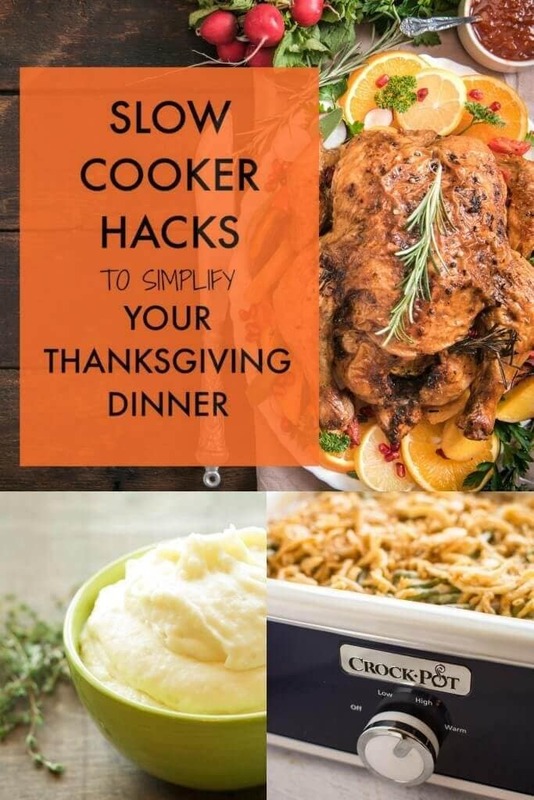 Want even more Thanksgiving dinner ideas? Check out this post with all my favorite tips! 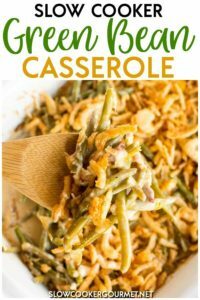 We made this for my hubby’s office potluck and he was very pleased with it — Green Bean casserole always having been one of his favorites! Do you have any suggestions for me before I triple this recipe ? I’m a little nervous with so much liquid . Thanks for any input ! You could hold back a little of the sauce if it seems like to much and then add it later. It should work out just fine, though! You should taste the multiple dishes Lynn Heuer makes (she lives in Schaumburg, Illinois), she could win prizes! I miss Lynn, I moved to Virginia to be near my daughters. HAPPY THANKSGIVING EVERYONE!! !